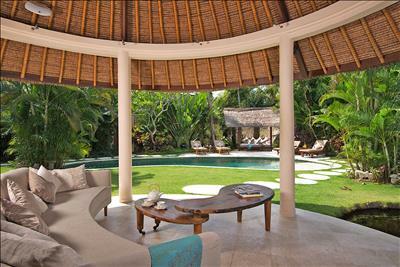 This private villa is an oasis of luxury and is one of Villa Kubu’s 2-bedroomed ‘Jewels in the Crown’. 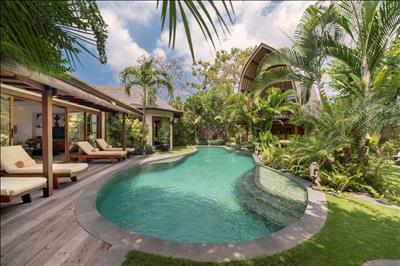 Villa 8 boasts an unusually spacious and decadent veranda, with two individually-designed, open plan seating areas enjoying fabulous views of luxuriant tropical gardens and a large private pool with Balinese ornate, stone water features. 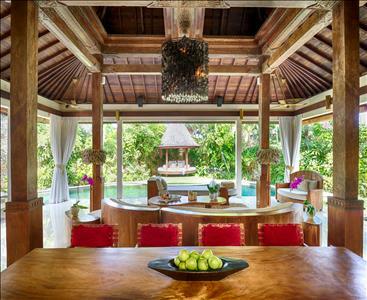 A large dining area holds an antique teak dining table and benches, a fully-equipped kitchen area with an open jungle backdrop, home to a mystical statue feature. 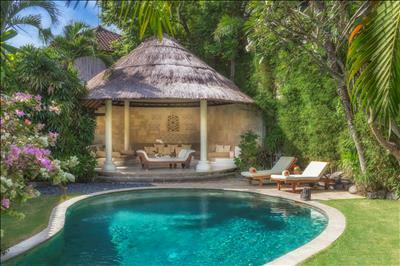 This lovely 2-bedroom Seminyak villa features a generous-sized, exotic, indoor-outdoor bathrooms with deep terrazzo baths, and glamorous, velvet “chaise longues” to complete this impressive picture. 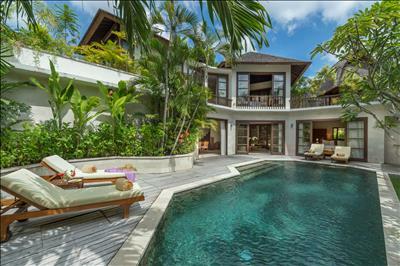 This private pool villa is ideal for a family of four with two children or a villa for entertaining; a spacious, picturesque and private retreat, which is especially well-suited for longer stays due to its generous proportions. 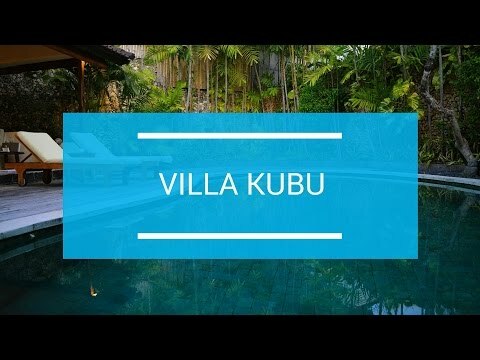 All of Kubu’s villas are serviced by a team of staff dedicated to making your every wish their command, including experienced chefs to prepare in-villa culinary experiences, silver-service butlers to deliver room service, highly-trained therapists from our Spa Venus, passionate gardeners and meticulous housekeepers. Thank you for everything. We stayed in Villa 8 really sunny, we had a really good time, great location near Seminyak. Thank you so much for having us stay.